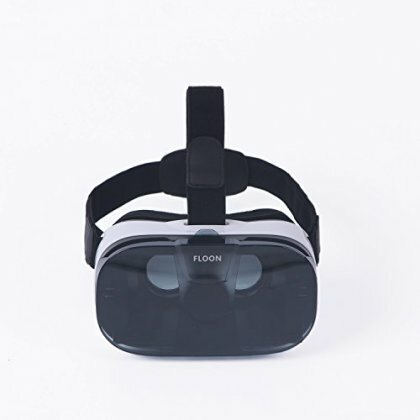 • DUAL VIEWING MODES - Complete with patented shade-kit technology (Square View Finder for Movies & Rounded View Finder for Video Games), the Floon F1 VR glasses give users the power to watch movies and play games in perfect visual fidelity with complete immersion. It also fully supports a wide range of iOS/Android/Windows mobile phones with screen sizes ranging from 4.0-6.0 inches. • BREATHABLE, COMFORTABLE DESIGN - The Floon F1 offers a more comfortable, form-fitting design completely with heat dissipation thanks to a cross-ventilation cooling system. This ensures that your phone never fogs up while in use, you don't perspire after extended use, and that you can still use charging and headphone peripherals with ease. • IMPROVED EASY ADJUSTMENT FEATURE - Unlike other VR headsets that make you readjust your visual settings each time you insert your phone, the Floon F1 features a unique middle line gear adjustment that is matched to your initial setting so you don't have to make frequent adjustments each time you use it. • FULL THEATER EXPERIENCE WITH FOV UP TO 102 °- The Floon F1 supports unilateral myopic adjustments from 0-600° as well as interpupillary distance adjustment from 58 to 67 mm. In other words, children and adults can wear our headset even if they wear glasses (if above 600°). Our distortion-proof HD aspheric optical lenses and high transmittance tech gives you a full 3D theater quality experience with the Extra Large Viewing Angles up to 102 °. • LIGHTWEIGHT TRAVEL SIZE WITH BEST BALANCE- Floon F1 realizes the best balance between the best immersion experience and the most suitable glasses box size, so perhaps the perfect thing about our Floon F1 headset is that it only weighs 263 grams. And with a polyester headband and reduced weight, you can wear it for extended periods of time without it hurting your neck. All of which make it perfect for home or travel use.